LD Lines, in conjunction with Entee Global Services and Ariane Marine, has become the first cross channel ferry operator to pioneer new technology with the introduction of self check-in facilities on one of its four major routes - the first being the Portsmouth - Le Havre service. The first phase has seen the installation of foot passenger self check-in kiosks in the ports of Le Havre and Portsmouth and bookings and ticket sales will also soon be made available via this same facility. 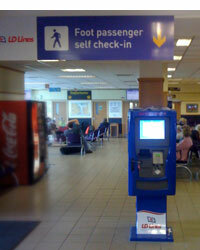 The self check-in system interfaces to the Entee WebRes ferry reservation system quickly and seemlessly using XML. LD Lines then plans, as the second phase of this project, to introduce vehicle and passengers self check-in facilities in these same two locations, in advance of the start of the peak summer season. Now that the Entee technology is developed, the roll out of this technology is relatively simple and will work regardless of Port or location. Managing Director of LD Lines, Christophe Santoni said, "As well as enjoying the on board experience, it is very important that all our customers are provided with an efficient, hassle-free service at our ports. Whilst passengers will still be able to choose the traditional check-in methods, this new facility will provide a modern, fast and convenient alternative, further improving levels of service." "This is initially being introduced on the Portsmouth - Le Havre route throughout this summer and then if, as anticipated, positive customer feedback is received, we will look towards introducing self check-in and ticket sales facilities at all other ports to which we operate." Simon Ashberry, CEO of Entee Global Services, added, "This is our second self check-in customer (the previous being HoverTravel) but the first cross-channel ferry operator implementation. We are very pleased to have been selected for such an innovative development and to have brought the project in on budget and on time for the 2010 season. "This is also the first self check-in project to fully utilise ferry ANPR cameras (Automatic Numer Plate Recognition) and vehicle height and length lasers in the ferry industry. It is a great showcase for the flexibility of the market-leading WebRes ferry reservation software product." Martin Putman, Portsmouth Port Manager, concluded, "We are delighted that LD Lines and Entee have chosen Portsmouth to pioneer this new technology. With a brand new terminal due to open at the port early next year, we're excited about another development that will further improve the travelling experience for cross channel passengers." LD Lines operates an exclusive network of four cross channel ferry routes between Portsmouth - Le Havre, Newhaven - Dieppe, Dover - Boulogne and Ramsgate - Ostend. For more information about WebRes ferry reservation system, LD Lines or Ariane Marine please click on the relevant link.